In this chapter various aspects of cemented stem designs such as shape, surface roughness and material properties are discussed. An attempt is made to provide some guidelines of design features, or combinations of them, that are known to lead to early failure. A design philosophy can be regarded as a good (or optimal) combination of design features. It will be shown that various design philosophies work equally well, but that an inferior design can result if their features are mixed. 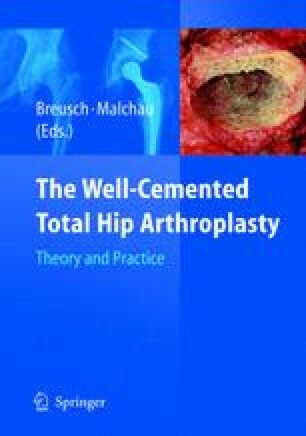 This will be illustrated by analysing the design philosophies of successful and unsuccessful cemented femoral hip stems.